Anna Maria Beach Place #4, located at 201 35th Street in Holmes Beach is part of charming beachside complex featuring six units surrounding a heated pool and tropical gardens. Immediately across a rarely traveled, dead end road are the white sandy beaches and the emerald green water of the Gulf of Mexico. It doesn't get much better than this! Two gas grills, an onsite laundry room, high speed internet with an expanded cable package and free domestic long distance calling are provided. There is an assortment of beach chairs and beach toys onsite for your use. There is even a video library onsite for quiet evenings at home. The building will sleep a total of 24 and is a perfect spot for family reunions and get-togethers. Unit 4 at Anna Maria Beach Place is a two bedroom, one and one half bath upper unit that will sleep six with a queen size bed, two twin beds and a sofa bed. There is a 42" TV in the living room as well as 21" TV's in both bedrooms. 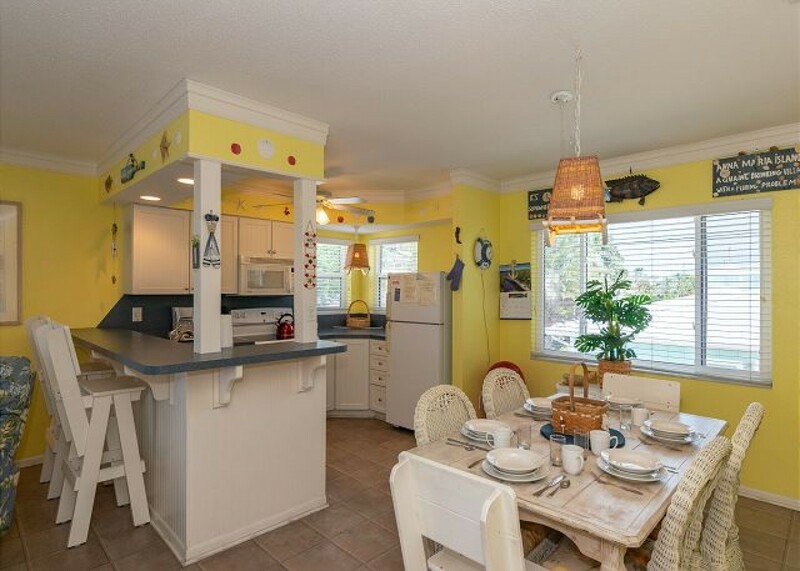 This totally renovated unit is furnished in fun, tropical colors and fully equipped with everything you'll need, including spectacular sunsets so you can relax and enjoy this wonderful Anna Maria Island getaway.